Andrew Whalen watches his putt. The senior helped lead the Wildcats to a third place finish at the Boilermaker Invitational. If only the second and third rounds counted at the Boilermaker Invitational, Northwestern would have won the tournament easily. But the first round counted, and the Wildcats really had no chance to win. NU started off fine, shooting even par on the first nine holes. But things went downhill after that, and the Cats shot 13-over on the final nine holes, falling to ninth place in the tournament. Coach David Inglis attributed the round to the windy conditions. 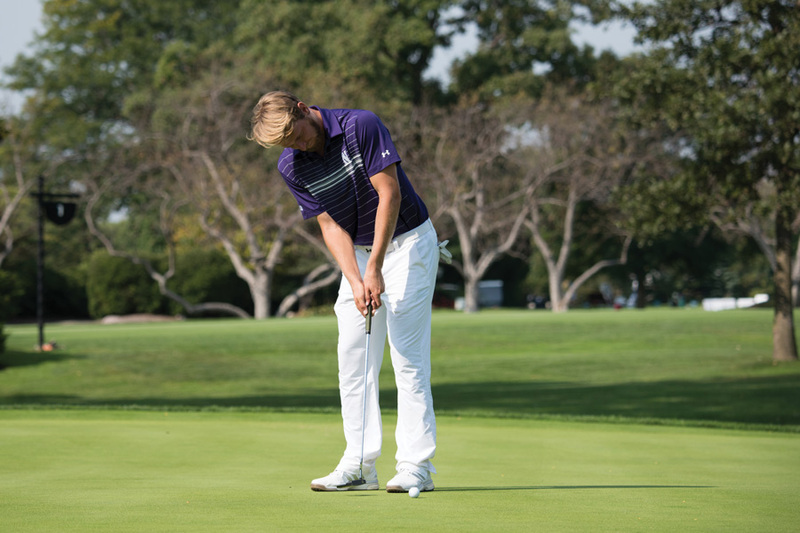 NU rebounded on the next 18 holes, shooting 6-over and fighting into a tie for fifth place. On Sunday, in the tournament’s final round, the Cats shot 9-under to finish in third place. Freshman Everton Hawkins shot a 4-under 68 in the final round and finished the tournament tied for 13th place, bouncing back from a tough showing at the Redhawk Invitational. Junior Dylan Wu and senior Andrew Whalen both finished tied for ninth, the highest finishes on the team. Aside from struggling on the back nine of the first round, both were consistent throughout the weekend and shot matching 1-under 71s on Sunday. No. 10 Kent State won the tournament, shooting 1-over for the tournament while having the top two individual finishers. Purdue, which hosted the tournament, finished second and NU slotted in third, ahead of No. 17 UNLV, which faded at the end of the tournament. Wu said the key to fighting through the tough conditions is trusting your game. Graduate student Conor Richardson finished fourth for the Cats, shooting 6-over for the tournament, but notching a strong 3-under 69 in the final round. Sophomore Ryan Lumsden rounded out NU’s five scorers, shooting 7-over for the tournament. Junior Sam Triplett competed as an individual and shot 12-over. The Cats finished third after finishing second in their last two tournaments. Whalen said the team will use the momentum from its final round on Sunday going forward into the postseason. This was the last tournament of the regular season for the Cats, who will now turn their attention to Big Ten Championships in two weeks. Inglis said he likes the direction his team is heading as it moves into the postseason.